Building on a foundation of diversity of thought garnered from his Albright days, Terrence Curtin ’90, CEO of TE Connectivity, embraces inclusion and diversity in the global workplace. 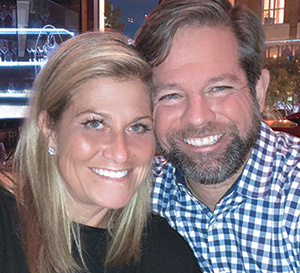 By the time he reached high school while growing up in Mount Penn, Pa., Terrence Curtin ’90 was looking for his ticket out of town. Reading was home to his family for generations. His grandfather worked in a hosiery mill and others were blacksmiths-turned-auto mechanics, in town. When colleges came courting for Curtin’s gridiron and baseball talents, he knew he found his golden ticket. His parents even said he could go to school anywhere he wanted in the United States. The world was his oyster, as the saying goes. Ironically, Curtin chose Albright. “I was not the most academically focused student in high school,” admits Curtin, “so I needed a place to push me and teach me to be more academically accountable. The environment and size of Albright were right for me, even if it was just over the mountain from home. On top of that, I met my wife, Robin Feldman ’93, there. We got engaged, after we graduated, on the steps of Science Hall. Every day since, I’m reminded how fortunate I was to go to Albright,” he quips. But stay in Reading, he did not. Since graduating in 1990, Curtin has traveled the world for business, racking up hundreds of thousands of air miles. First with Arthur Andersen, one of the big six accounting firms at the time, that recruited him for his ink-still-wet accounting degree. Today, with TE Connectivity, a global industrial technology company, where, as CEO, he leads 78,000 employees in 150 countries. TE is a world leader in the design and manufacture of connectors and sensor systems built to withstand harsh conditions. Their products are found on space rockets, oil rigs, and drones. Everyday items too, like appliances and cars. “Our purpose of what we do at TE is to help make the world safer, more sustainable, more productive, and more connected—in the systems we all rely on. It’s important that they work well and are completely reliable. That’s what we get excited about here at TE,” enthuses Curtin. Proof to his point is a companywide agenda focused on the belief that within an inclusive environment, each employee has the potential to thrive, and thus, so will the company. TE’s Employee Resource Groups (ERGs)—Women in Networking, Young Professionals, African Heritage, Veterans, and ALIGN (LGBTQ)—provide resources, mentorship, and professional development to members of these groups within the company. And, the entire month of May is dedicated to celebrating inclusion and diversity with forums and seminars offered companywide, which means, worldwide. Confirmation that TE’s inclusion and diversity efforts are working as shown through the many impressive awards decorating the lobby of its Switzerland headquarters. It was named to the Human Rights Campaign (HRC) 2017 and 2018 Best Places to Work for LGBTQ. TE was named one of 2018’s World’s Most Ethical Companies by Ethisphere Institute for the fourth consecutive year, and is on Fortune Magazine’s 2018 list of Most Admired Companies. “How has this changed me? I came out of college as a finance person. I dream in numbers,” laughs Curtin, “but I feel passionate about inclusion and diversity because it’s helped in my own learning. Through my 17 years at TE, I’ve been able to grow up in a truly global world. It was a shock to my system coming from Albright—a few square blocks—to get thrown in a global stage. But Albright gave me a good foundation; I learned diversity of thought. As someone who was still maturing in college, around the scholarly side of things, it opened my mind. That’s what’s neat about Albright. When you think about the liberal arts element: how do you broaden someone’s thinking when they’re coming out of school to make sure they get that dexterity in thinking as they get older? “At TE, I continue to build on what I learned at Albright around diversity of thought. With 78,000 employees all around the world, we have tremendous global diversity of our teams. I’ve been fortunate enough to learn from all those cultures. The goal is: how do you get the benefit of that thought diversity of different cultures? You always have to start with inclusiveness first before you’re going to get to diversity.